Color of the Month February 2018! February! January zipped by a bit with feeling under the weather for weeks. These winter days are chugging along and I’m dreaming of the garden every day, slightly avoiding working on taxes, but meh, they’ll get done. The days are noticeably longer and the sun is peeking out a bit more it seems. The birds and squirrels are pretty active and I’m starting to hear some birds singing in the morning which gets me excited for the promise of Spring around the corner! It’s a couple weeks until Valentine’s so this month’s color is PINK! 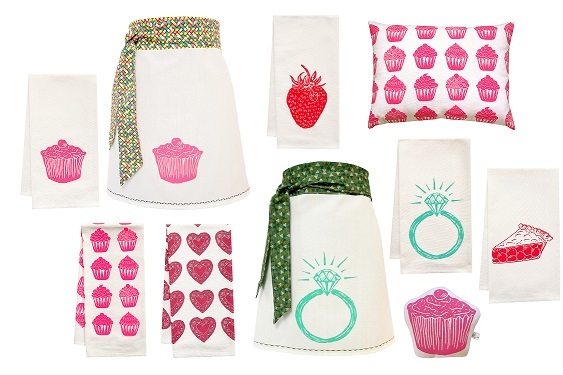 And don’t forget you can shop now for there are plenty of artgoodies products that fit the season for decor or gifting! 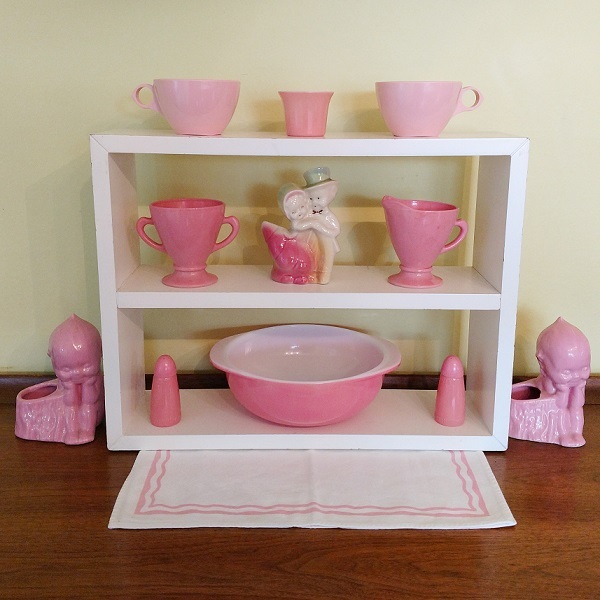 Fave vintage: pink melmac, tiny Hazel Atlas planter, cute couple planter, Hazel Atlas cream n sugar, Pyrex bowl, and Hazel Atlas salt n p’s. 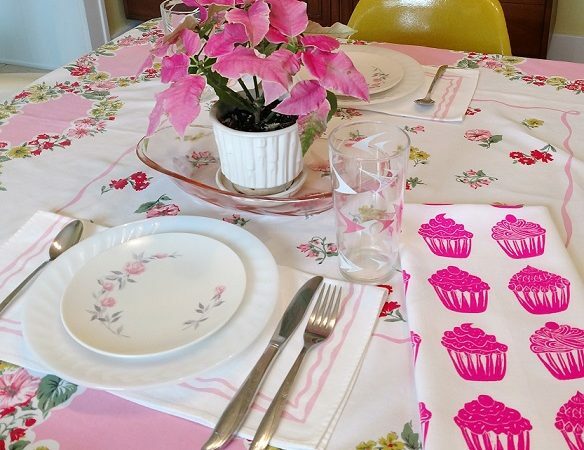 AND 2 funny Kewpie planters from my personal collection, anchored by a simple pink edged vintage napkin. Lots of this available in the vintage shop as usual! 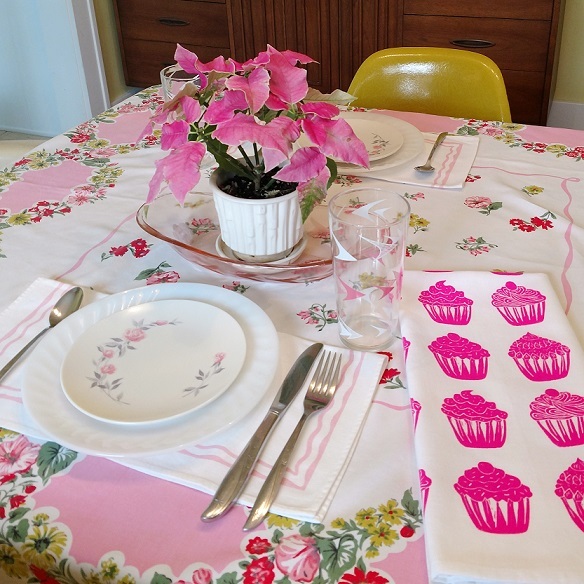 Fave vintage: pretty floral tablecloth, Fire King plates with melmac on top, boomerang glasses, pink edged napkins as placemats, and an artgoodies all over cupcake organic tea towel! Plus this very pink poinsettia is still looking smart in its MCCoy pot! Oh, and that depression glass oval etched bowl is quite pretty!